The major problem with Africa is not the lack of water; it is the lack of infrastructure to supply water to domestic and residential areas. Africa has many large lakes, and big rivers that can supply quality drinking water, but due to political, economical, financial and environmental changes the water is not reaching the areas where it is needed the most. Estimations speculate that over 1 billion people in Africa do not have sufficient access to clean and safe drinking water. 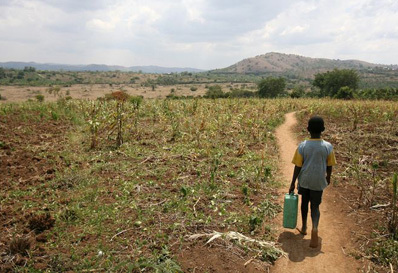 Children in Tanzania, Ethiopia and many other drought stricken countries have to walk on average two hours each day to collect drinking water, and the majority of the time the water source is shared with livestock and is not safe for human consumption. The results are hours of time wasted in collecting dirty water that leads to the biggest cause of death in Africa. The United Nations estimated that the wasted time collection water in Africa each year is equivalent to an entire years worth of labour in France’s workforce. Diarrhoea and infections lead to more deaths each year in Africa, more deaths than any war ever could ever achieve. In the worst countries, it is estimated that 3 out of 4 children have severe diarrhoea or life threatening infections and diseases. On the other side of the globe, first world countries like the UK, USA and their respected continents have water to waste. Children in the United Kingdom use more water each day to flush their toilets than African children have to use for an entire day. Clean, safe and fresh drinking water is available on tap in your home, and no thought is spared for where it comes from, and how difficult life would be without it. Water companies install water coolers and filters in your home, gym and office, but do they assist any water projects in drought stricken areas? Consider these facts when selecting a water supplier. Companies like AquAid have donated more than £6,000,000 to aid water projects in the Third World. They donate a large percentage of their products sales to aiding the less fortunate in Africa. The economic factors are astounding if you consider that for every £1 that is invested in drinking water projects in Africa; there is a £3- £20 return on economic growth. Just by selecting a water cooler company like AquAid, and using their products, you will actually be assisting in alleviating drought, increasing productivity and creating economic growth and stability in Africa.